How do you say cheesesteak with in Spanish? 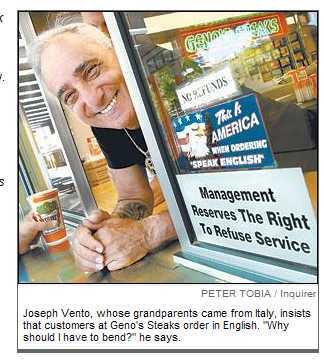 Joseph Vento, the owner of Geno’s Steaks, doesn’t know. And he doesn’t care. Just read the laminated signs, festooned with American eagles, at his South Philadelphia cheesesteak emporium: This is America. When Ordering, Speak English. …The Ventos rarely left their South Philadelphia neighborhood. Now, in a way, the neighborhood has left the couple’s descendants. Geno’s sits at Ninth and Passyunk, the hub of Little Italy turned home to thousands of Mexicans. Some try to order a cheesesteak. And it bugs Vento if they can’t ask for American cheese, provolone or the classic – Cheez Whiz – without pointing. “If you can’t tell me what you want, I can’t serve you,” he said. “It’s up to you. If you can’t read, if you can’t say the word cheese, how can I communicate with you – and why should I have to bend? Vento, who lives in Shamong, put up the signs when the immigration debate seized national headlines six months ago. With Geno’s Steaks tattooed on his arm, Vento is used to publicizing things, especially what’s on his mind. Speak English signs also poster his Hummer. He has driven through South Philadelphia blaring through the SUV’s P.A. system denunciations of neighborhood business owners who hire illegal immigrants. “I say what everybody’s thinking but is afraid to say,” Vento said. Good for him, I say! We need more Americans speaking up and speaking out about this! !